The island was first settled in 1650. Until 1825 it was administered by Britain through Antigua. In 1825 it was placed under the administrative control of St Kitts. 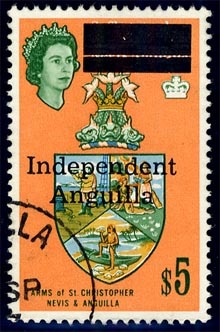 In 1967 the island declared self independence and briefly called itself the "Republic of Anguilla". Their goal was to be independent from St Kitts and remain a British colony. British authority was restored in 1971 and the island was granted limited self-government in 1976. The first post office on Anguilla, a sub-office of St Kitts, was opened in 1900. It was supplied with an A12 duplex canceller with the code letter AN in the date stamp to signify Anguilla. The canceller was sent out from London on 10 May 1900 and was in use till 1927. Up till 1967 the island used stamps of St Kitts-Nevis or St Kitts Nevis & Anguilla (from 1952). Since 1967 Anquilla has produced its own stamps. The main goal of the British Caribbean Philatelic Study Group is to promote interest in, and research into, the stamps and postal history of the British Caribbean area. Promote interest in and the study of the STAMPS and POSTAL HISTORY of the islands that comprise the BRITISH WEST INDIES and in addition Bermuda, British Guiana (Guyana) and British Honduras (Belize) and the Postal History and Markings of other British interests in the Caribbean, and Central or South America. The Anguilla Philatelic Bureau releases five to six issues annually and definitive stamps are issued every 5 years. The first meter inscribed ANGUILLA appeared in 1985.